The league stage of the Indian Super League is on the verge of conclusion with all ten sides having taken the field 17 times this season. 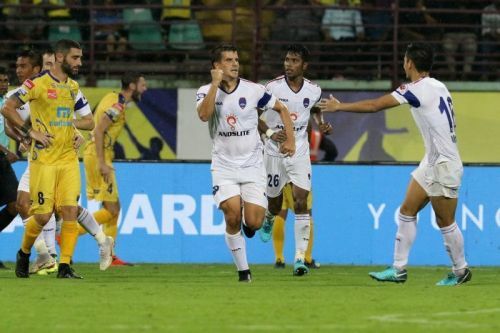 There have been plenty of surprises throughout the journey and four sides including Bengaluru FC, FC Goa, Mumbai City FC, and NorthEast United FC will be heading into the playoffs round as they battle out for their debut league wins. Club invest huge sums of money on the players, and while some players have been involved to help their side reach heights, others have struggled to stamp their authority in the league and the whole team has failed collectively. Due to underperformance and poor results, FC Pune City and Kerala Blasters FC have sacked their coaches. There has been plenty of hits and flops throughout this season. In this article, we shall look at five foreigners who have failed to produce the expected output this campaign. Having made his name at Red Star Belgrade and Racing Santander, many good things were expected on the pitch from Andrija Kaludjerovic. But, his form was never satisfying for Josep Gombau, who decided to let the Serb leave after the completion of the first part of the season. The Serb took the field 12 times for the club and was able to find the back of the net only once. Despite the supply from attacking midfielders Rene Mehelic, Lallianzuala Chhangte and Nandhakumar Sekar, Kaludjerovic was not able to benefit and struggled to find his feet. Tactics tweak in the second half of the season saw the Dynamos getting totally rejuvenated and pick up good results and sit 8th in the league table. Gombau decided to put his trust on the young striker Daniel Lalhlimpuia and the Indian International was able to bag four goals during this period which is a decent record, to say the least.